I have spent the past few weeks in a beautiful retreat center in Northern California, enjoying a wonderful and healthy balance between work, soaking in the natural springs and taking care of myself. When I awoke up today, making my way to the restaurant to get breakfast, I passed by a parking lot. There, I saw a turkey that desperately ran around a parked car. Every few seconds the gobbler pecked full force into the car while flapping its wings impressively. 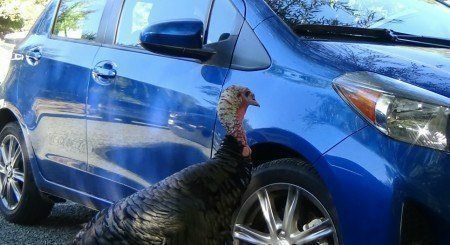 I was wondering what the turkey was doing and upon closer look, I noticed that it could see its own reflection in the shiny polish of the car. The poor turkey saw its own image reflecting back to it and seemed to desperately want to impress, or fight, his perceived opponent. After looking at the spectacle for a while, I noticed the car showed already visible signs of damage from the turkey attack. While it was amusing to look at the spectacle, I started to feel sorry for the obviously exhausted gobbler, as well as the car owner, who I am sure, would not appreciate to see his car in such bad shape, so I decided to hush the gobbler away. When I did, a man who just happened to pass by laughed at the scene and told me that the gobbler had already been engaged in this futile fight for a couple of hours. I left the “crime scene” to get breakfast and I thought of what the turkey had done was actually a great analogy of what we humans often do to ourselves. Without any self-awareness (like the gobbler that did not recognize its own reflection), we often fight against ourselves. Of course, this fight is not a real one, but one that goes on in our minds. While the “real” fight of the gobbler left visible signs of damage on the car, the fight that goes on in our minds is not immediately visible, but will eventually also leave its mark. When we harbor self-defeating thoughts, we put ourselves down, which will making us feel bad about ourselves. When we do this long enough, not only will our self-confidence suffer, but our bodies will take a toll as well. Every time we engage in an act of violence towards ourselves (which it really is), our body will perceive this a threat, producing stress chemicals that will eventually make us sick. I am no stranger to this. Even though I know better, it happens to me too. Like you, I have days, which I judge as “good”, and some that I judge as “bad”. On the “good” ones, I feel good about myself, because I am not internally fighting against myself. On the “bad” days, my inner critic comes in full force, and if I am not cautious, I can work myself into a negative spiral of self-defeating thoughts that not only ruin my day, but are hard on my husband as well. He has to put up with my negative mood. Of course, “bad days” can be brought on by things that happen, which I harshly judge and resist and don´t want to happen. This is how the negative cycle starts. That is when I have to remind myself of the power of accepting a situation as it is, to not judge it or myself, and then I can start to relax. So what if we could become more self-aware (the gobbler would have needed this too!) and start observing our negative self-talk to stop it in its track? I am certainly working on this, and yes, it is something that I have to do daily. I just have to remind myself to do it, because I also know that it is a powerful practice as I have also experienced the “positive flip side” when my mind completely stopped judging myself, other people and my life. When this happened, I was truly free. There was so much spaciousness, joy and love within me and my life. It was an incredibly powerful experience. Even though my situation had not changed, I perceived it differently, because there was no more filter of judgment between my mind and reality. I could see and experience people and things as they really were and not how I wanted them to be. It was so beautiful and liberating and even though this state of being did not last, it gave me a glimpse of what is possible. I know that through doing the work of observing my thoughts, I can learn step-by-step to experience this freedom gradually, but steadily. And I know this is possible for you as well. When you do, your life will change. It will become better and more enjoyable. You will start to experience it with less friction and upset. This will help your health improve as well. In that sense, I am grateful for the turkey gone rogue this morning as it taught me a powerful lesson. PS: What is your experience with self-defeating thoughts? Do you have a favorite strategy to bring yourself back? Let me know below.